Rossendale Borough Council have published their revised draft Local Plan and you have until the end of the final consultation period on 5th October to make your voice heard before the Local Plan is submitted to the Secretary of State (Planning Inspectorate) for examination by an independent Planning Inspector. The 800+ objections made in 2017 to the previous draft Local Plan ARE NOT carried forward as objections to the revised Plan. The Plan can be viewed online at https://www.rossendale.gov.uk/localplan or at local libraries and the One Stop Shop at Futures Park, Bacup. Despite the strength of local feeling with over 800 objections made last year to the proposals to remove land from the Green Belt in Edenfield, the revised Plan still proposes the release of 45 acres of Green Belt land and the building of 456 houses in the village including 400 on the Green Belt land in the area west of Market Street. This will virtually double the built up area of the village and increase the population by at least 50%. 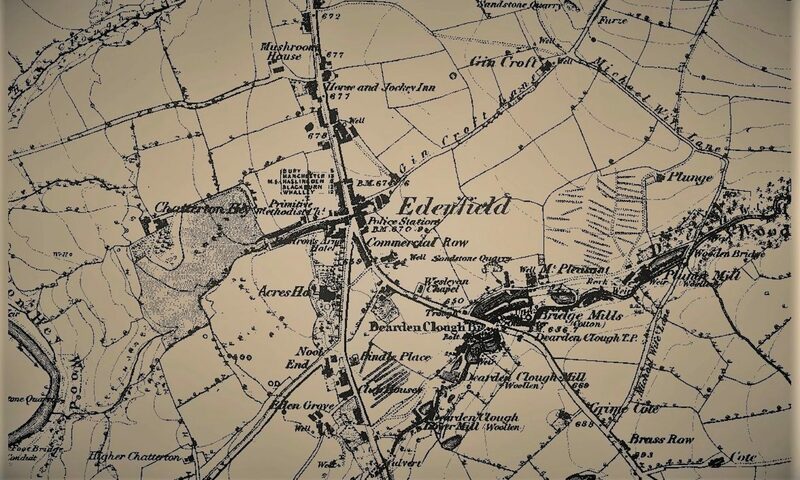 It is the view of the Edenfield Community Neighbourhood Forum (ECNF) and the Edenfield Village Residents Association (EVRA) that the draft Local Plan does not meet the soundness test for a number of reasons. ECNF and EVRA are, with professional advice, preparing a comprehensive response to the draft Local Plan which will be considered by the Inspector through an independent public examination before issuing a report to the Council. We consider there are sufficient developable brownfield and other sites within the Borough to satisfy housing need without the need to release Green Belt land for development. There are over 1,000 empty homes in Borough that have not been taken into account when assessing housing supply. The Council have failed to demonstrate that ‘exceptional circumstances’ exist to propose the removal of Green Belt in the Borough and therefore the proposal is contrary to national planning policy. The A56 as a possible Green Belt boundary does not justify the release of the land to the east of it from Green Belt. The contention that the release of the Green Belt will have only minimal impact on openness is unfounded. 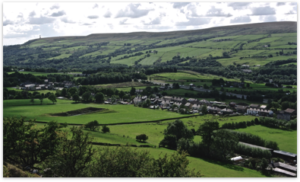 The transport access arrangements for strategic development in Edenfield are inadequate and have not been tested or considered by the Council before proposing the allocation. The impact of strategic development in Edenfield on the junctions and roundabouts in the area have not been fully tested by the Council before proposing the allocation. It is important that ECNF and EVRA can demonstrate that their objections have wide popular support. If you support an objection to the Plan on the above grounds please confirm by either completing the objection form below. This must be done no later than 4th October. Please do this whether or not you intend to submit your own representations about the draft Local Plan. Every name will help further demonstrate the local support behind our objections. Please encourage every adult in your household to object. irreplaceable Green Belt land in our village. *I support the representations made by Edenfield Community Neighbourhood Forum and Edenfield Village Residents Association to the Rossendale Draft Local Plan August 2018. 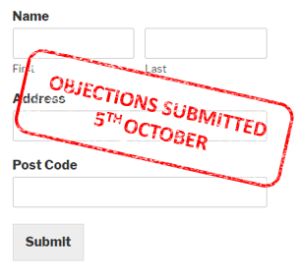 *If more than one adult at your address wishes to object, please complete the form once for each objector. If you’re sharing the form with friends online they may also visit a more concise version of the page here. If you’re having difficulties completing the form, please send us an email and we’ll help you if we can. Signatories must be over 18 years of age. 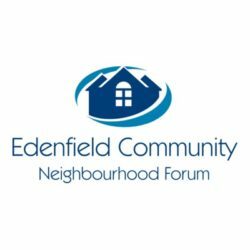 Your personal details will be held by the management committee of Edenfield Community Neighbourhood Forum and be shared with The Planning Inspector. It will not be shared with any other third parties without your consent. The traffic congestion is a major point of concern. The volume of traffic has increased 10 fold in recent years with commuters looking at every possible route to get too work especially when the A56 / Edenfield By-Pass / M66 is slow moving (rush hours both am and pm) or blocked (at least once per week). The air quality is impaired and I would suspect it would fall outside the levels accepted. The risk to life increases considerably as emergency vehicle access is compromised. The second major concern is the impact on the environment especially the damage to wild life existence and very possible damage to the water table and surface natural drainage. All the land around the Rossendale Valley and they want to build on the field at the back of Eden Avenue, One of the most used areas in the village, even the local farmer has been taking the hay off this year, making it being used even more by dog walkers and children playing as there is now a bigger area since all the grass has been cut. It beggars belief that they will ruin the beautiful area. I also hear that they will put double yellow lines down Exchange street as this will be the only access road. UNBELIVEABLE . Where are the residents of the street going to park, some of which are quite old. The whole idea is preposterous. Have they considered the wild life ??? including the deer. I just hope and pray that the Church and planners eventually see sense.